Early visitors to this historical wonder observed smoke-like steam emitting from the cave’s chimney, and named it “Devil’s Den”. An archaeological jackpot, Devil’s Den has been host to numerous fossils, including an early hominid dated 75,000 BCE, and a menagerie of now long-extinct animals. 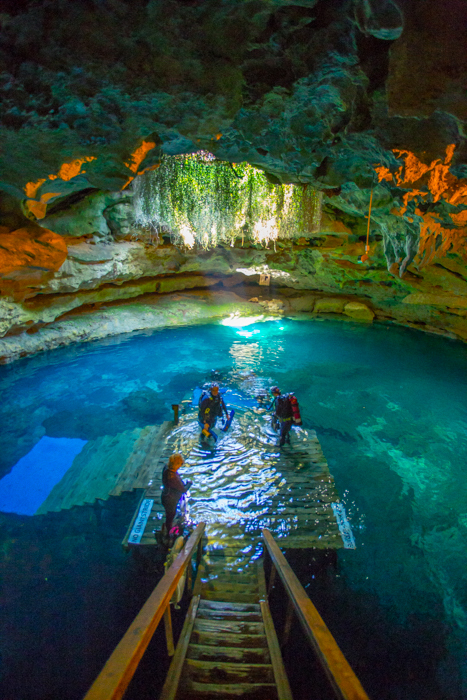 Like many north Florida springs, the water is a consistent 72 degrees inside the Den, so its intriguing rock formations and natural beauty remain accessible to snorkelers and divers all year. This spring is open to snokelers and divers only. Due to its splendor and historical richness, the site is extremely popular, and capacity is limited for safety reasons – if you plan to visit during the heavily trafficked summer months, consult http://www.devilscen.com for average wait times.